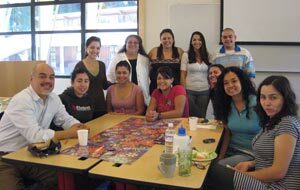 Pulitzer Prize-winning journalist and UCSC alumnus Hector Tobar spoke on campus November 15 at a luncheon reception sponsored by El Centro: Chicano Latino Resource Center. Tobar, 44, Mexico City bureau chief for the Los Angeles Times and a national best-selling author, spoke about life in the real world and discussed the challenges facing the Latino community. Tobar's novel The Tattooed Soldier is published in paperback by Penguin Books, and he was a finalist for the PEN USA West Award for Fiction. His most recent book is the nonfiction Translation Nation: Defining a New American Identity in the Spanish-Speaking United States. Tobar, an Oakes College alumnus, earned a B.A. in Latin American studies and sociology from UCSC in 1988.